Repair and maintenance of your car does not always need to involve a professional. There are some things that you can do on your own, especially when you have the basic tools that are required. With this, one of the essentials would be the best car lift for home garage. This makes a great alternative to the conventional car jack. With a car lift, it will be easy to work under the vehicle without worrying about your safety. Not all options, however, are created equal. To make the right decision and to prevent your money from going to waste, read the rest of this guide and be inspired by the models that will be briefly reviewed below. If you are finding it hard to decide which product is best to purchase, keep an eye on the brands and the models that are mentioned in this section. This is an expensive option for a car lift suitable for a home garage, but the price is definitely worth it. It has an exceptional build quality, providing an assurance that it will last for many years. Plus, it also has a maximum capacity of 5,000 pounds, which is already pretty much impressive. It has a reinforced upper frame that is made of welded steel, which is great when it comes to durability. It is also a good thing that it comes with extended block trays. With the latter, you will have easy access to several points, making it almost effortless to work under your car. Meanwhile, with zero leak fittings, frustrations can be minimized with the use of this model. It has flush-face hose fittings, making it possible for the liquid to stay in place. This allows you to do more work in a short span of time. It is also notable because of the open-center design, which is another proof that it is built with your needs in mind. You can have uninterrupted access to the undercarriage so that you can work without limitations. In terms of technical specifications, this car lift has a frame length of 70 inches, lowered height of three inches, and a maximum rise of 21 inches. This is versatile enough to be used in a wide array of vehicles. If the weight capacity of the car lift is an important consideration, you will have a good reason to have this chosen above others. Based on the technical specifications from the manufacturer, the maximum weight capacity is 8,000 pounds. Meanwhile, the height is 84 inches, length is 175 inches, width is 93 inches, and runway length is 165 inches. In terms of portability, this can also prove to be an excellent choice, making it effortless to be moved around the garage. One of the reasons for this is because it comes with smooth-rolling casters, which can be set in a locked position. There are also design elements that are notable, making the car lift user-friendly. For instance, there is a drip tray to catch any fluid, which will prevent the work area from being messy. There is also a jack tray. To power the lift, it comes with a 110-volt motor. You will never be frustrated as it delivers reliable functionality. This makes the performance fool-proof. Also, as the manufacturer claims, it has a tried and tested design for more than two decades now, which should already make you confident about its quality and functionality. With a capacity of 9,000 pounds, this will work great even for vehicles that are heavy. It can keep the car in a stable position, allowing you to work without thinking that the car will fall flat on your face. You can concentrate on the work being done and no need to think about your safety. The car lift comes with an all-steel construction, which is one thing that sets it apart from many of the inferior models that you can find on the market. Because of this, it is rigid enough to support even a large weight, as long as it is not above the stated capacity of the lift. This model has a maximum lifting height of up to 72 inches, which is high enough for most people. To be able to lift the car, it uses a hydraulic mechanism. Raising your car to the desired height will also be a snap as it can be operated in a manner that is user-friendly. It also comes with a variable lift speed. This will mostly depend on the weight of the vehicle that it is going to lift. Another good design feature of this model is the three-stage extension mechanism. You can extend the length of the arm in three stages, which is great when it comes to versatility. This model comes with a maximum lifting capacity of only 5,000 pounds. This is less than the two models that have been previously reviewed, but this should not give you the reason to ditch the idea of having it purchased. For this, it is recommended only for light-duty trucks. The power of this car lift comes from the 1-phase electric motor. It is smooth and does not make an annoying noise as it lifts. It is also a good thing that it takes only 45 seconds before the lift can set the maximum height at which you want your car to be. The lowest height of this car lift for home garage is 4.75 inches. This scissor car lift is pretty much easy to use. It does not take an expert to figure out how to lift your car. Plus, it also has an adjustable arm, which will offer versatility when it comes to how you can have the vehicle positioned once it is in the lift. Meanwhile, with the multi-position safety lock bar, you do not have to be concerned about your safety as you work. Another thing that you will love about this product is that it comes with a bonus package – a truck adapter package. This is sure to provide you with huge savings! This is perhaps one of the most expensive options that you can find on the market, but this should not be a reason to have it ditched in favor of cheaper models. For sure, the price will be worth it. It is a two-post lift that can deliver a performance that will be hard to match. It comes with a 10,000-pound capacity, making it the perfect choice even for large and heavy vehicles. The Low Pro Arms design is one of the exclusive features that you have to know about this car lift. With the latter, it will be able to lift even lowered sports cars without any problem at all. It also comes with a technology that is known as the Tru-metric carriage, which will provide the flexibility when it comes to how the vehicle will be loaded. You can load it symmetrically or asymmetrically. Another thing that makes this versatile is the expandable top beam, which will allow it to accommodate drive-through configuration whether it is wide or narrow. 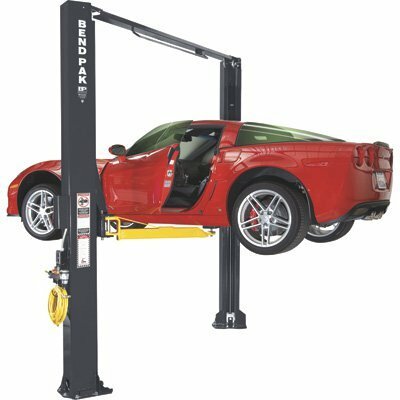 The overall height of this car lift for home garage is 145 inches. Meanwhile, under the narrow configuration, the width is 80 inches and 102 inches under the wide configuration. Before you decide on the brand and model to buy, you should be familiar with the different types of car lifts that you can use in the home garage. 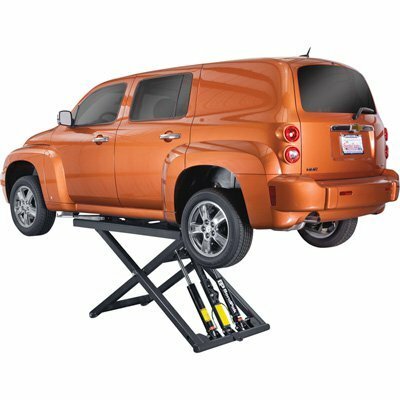 Two-Post Car Lift: If you are looking for an option that is budget-friendly, this is what you should buy. It is good for short-term repairs and casual use, especially if you have a small and lightweight car. 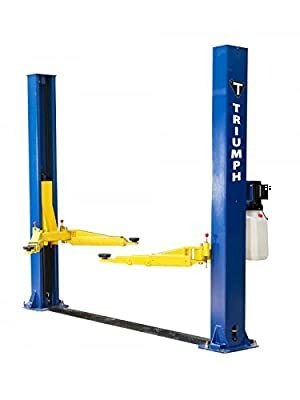 Four-Post Lift: This is a more expensive option, but it will be worth your money given the fact that it can support a heavier weight. It can have caster wheels or permanently installed. It also makes it easier to load the vehicle while having an assurance that it will remain stable. Scissor Lifts: This is also a popular choice amongst car owners because it is easy to use. When it is not used, it lies flat on the floor, which makes it a space-efficient option. However, it limits access under the car. Safely Work Under the Car: This is perhaps the most common reason why people invest in a car lift. When the car is lifted, it will allow you to access whatever is underneath and work without being concerned about your safety. Doubles Garage Space: If you have a small garage but you have to park at least two cars at a time, a car lift will prove to be an excellent investment. You can park one car on the top and one on the ground. Protects your Car: If you live in a place where it often rains and where the flood is a problem, you will also love a car lift. As the car will be elevated, you can be confident that it won’t be reached by flood, offering protection from inclement weather. It is a fact that you will have endless choices for car lifts, but this should not be an excuse for you to choose just any model. To be sure of making a decision that you won’t regret, these are some of the most important things that you have to consider. Size: There are two things that you have to think of – the amount of the space that is available in the garage and the size of the vehicle that you will put in the lift. This will help you decide on the lift size that is appropriate for your needs. Capacity: The models that are reviewed in this guide have a weight capacity of 5,000 to 10,000 pounds. If you will use it for a small car, a small weight capacity will be more than enough. Ease of Use: From the installation to the operation of the car lift for the home garage, you need to make sure that it is user-friendly. The manufacturer should include comprehensive instructions with regards to its use. Stability: It is also important that the car remains stable when it is on the lift. If it keeps on moving or if the post is wobbly, this is going to compromise your safety. There should also be a lock to keep it in a specific position. Speed: This is an important consideration for people who do not have the patience to wait. Most of the lifts are able to lift in under a minute. If it takes too long, this means that the motor is not powerful enough. Versatility: By being versatile, this means that it can offer multiple ways to be used. It will be good if the height and the width can be adjusted based on the vehicle that will be used. The adjustments should also be effortless for you to make. Durability: When comparing the options that are available, you should also look at the materials that are used in the construction of the car lift. Steel is a common material, which has the ability to support even heavy cars. Warranty: Within the warranty period, the manufacturer will offer free repair and even replacement of parts if in case it becomes defective. However, this will depend on the terms and conditions that are specified by the company. Choose the right location in the garage. If you have a large garage, it is best to put it on either the left or right side, not in the center. This is going to free up more space for you to move around. Inspect the lift regularly and make sure that you correct any problem as soon as possible. Lubricating should be a part of regular maintenance to make it less prone to wear and tear. Make sure to follow the capacity of the lift that has been stated by the manufacturer. This is an important safety tip that you should never ignore. You also have to think of the construction of the ground where the lift will be positioned. See to it that it is strong enough and that it won’t give up to pressure. Always be alert and be aware when you are using the car lift in the home garage. If you hear any weird sound or if you suspect that something is wrong, check it out immediately. See to it that there are no potential hazards. Keep children away from the work area. Read the instructions from the manufacturer and make sure that you follow what is stated in the manual. This is especially important for your safety. 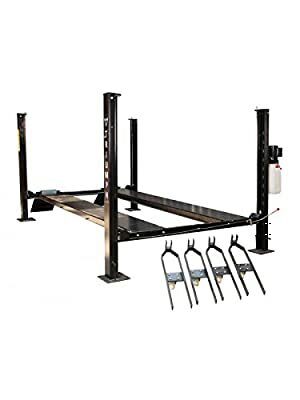 In sum, the best car lift for home garage is an investment that you have to consider, especially if you like doing repair jobs on your own instead of heading to a mechanic in a neighborhood. It lifts your car higher and it is more stable compared to a traditional jack, making it able to support a heavier weight as well.